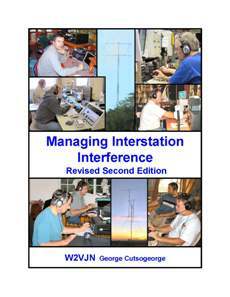 "Managing Interstation Interference, Revised Second Edition"
This book covers how to evaluate interference problems and how to solve them. This is important material for anyone that runs more than one transmitter in his station. Many practical examples of isolation obtainable between towers and between antennas on the same tower are given. There is in depth coverage of coaxial stubs: how to make them, how to use them, what kind of performance to expect and the various types to use. Much of this material has never been published before in the amateur magazines.